My son, (my baby) got married in October. Married a wonderful girl, Bethany. They have been together 3 years. All of that time, they have lived away from us. Mostly Utah and one year in North Carolina. We get to see them, maybe once a year; twice if finances allow. I’m very impressed with her – although I try not to let the fact that he picked someone that is my COMPLETE Opposite upset me (too much). She is beautiful, sweet, soft-spoken, smart, caring. Tends to cry, but that proves she has empathy. I think being the mother-in-law to a daughter is going to be Totally different than to a son. I had 2 son-in-laws. Piece of cake! They are more than halfway scared of you anyway. I just kind of went with that! In this case, I think I’m actually going to have to work at it! He chose her over me. So, even though I told her at the wedding that he was “on loan” to her for 50 years, if it comes to a draw – she’ll win! Brother! I hope they move closer so we can “work” on the relationship. Maybe she’ll read my blog and get to know me better. Brian and I used to joke when he was in school – he’d say, “I’m not going to bring her (who ever at the time) home to meet you. You won’t like her”. I said, “Brian, if you can Ever find Anyone who is willing to put up with You, on a permanent basis, I will Love her. She will be my Best Friend!” Welcome to your Best Friend, Bethany! Take care of my boy! I love you! Stay tuned. My husband, as well as most people who know me, have always had alot of fun, at my expense. That’s okay. Some days, I think maybe that is why I was put here – to make someone laugh! That’s the Only way to explain most of the things that happen to me! (You’ll see). Back in the early ’80s, when our section of the subdivision was new, we held “block parties”. For those of you who are younger than me (and don’t know your neighbors’ name), a Block Party was where we closed off the street to traffic, and all the neighbors got together for the day. We set out food, drinks, games for the kids, lawn chairs for the old folks and just spent the day talking, visiting, getting to know each other. One year, after the day’s festivities, we all gathered in one neighbor’s backyard and built a bonfire. The kids had gone inside to play or watch T.V., so the adults sat on the ground, in a large circle, around the fire. It had gotten chilly, so I remember we were wearing windbreakers (jackets). We were telling stories, laughing, having a great time. This particular neighbor had a little dog; Jack Russell, I believe, Anyway, there are maybe 20 of us, sitting in a large circle and this dog is going around behind us, person by person, sniffing. He makes the rounds, once, twice, stopping, sniffing, moving on, His 3rd trip around the circle, he backs up to ME, lifts his leg, and for the count of 20 seconds, Pisses all down MY back! Doug laughed so hard I thought he was going to roll into the fire! We left to go home shortly after. Stay tuned. I know what this time of year represents. I love Jesus, believe He died on the cross for my miserable self, etc. But that is the Big picture. In Real life, I believe, you have to break it down to small, individual acts of kindness. Oprah was on to something. Daily, we need to try to do one, small, thing for either a friend, family member, or total stranger! This is the season when we drop some coins in red buckets outside Walmart’s or pick angels’ names off a tree to purchase them a gift. And that is Wonderful! Good for you! But what happens the other eleven months of the year? I know – we can’t be responsible ALL the time. But let me give you a couple of examples of things you CAN do. I know of a young woman whose teenage years were troubled. Not as bad as some, but she had her problems. She came from a loving home, but her extended family, (grandparents, cousins, aunts/uncles) were largely absent. At any rate, word went out around the family concerning some of the issues this girl was having. A month or so passed. One day, in the mail, this girl received a one page letter, addressed to her, from her grandmother, who she had only seen, maybe five times in her life. The letter wasn’t much – to you & I. Mainly it said, “Don’t give up, God is good”. Something along those lines. This girl read the letter, folded it and put it in her wallet; where she carried it with her, everyday, for the next ten years. She referred to it, many times and the comfort it gave her was unmatched. I have a card that I received from a Very Special friend in my life. I, too, carry it with me, everyday. It means the world to me to know that (at least) One person, in the world, thinks I am special. Thinks I am worth taking their time to sit down, write their thoughts on paper, and send them to me! You can Never, ever know how much a small (to you) gesture can mean to another person! Coming at a crucial point in their lives (even if you don’t know that), can forever change their outcome. We all have “those days”. Everyone has troubles – all year. Not just in December. I think, to honor Jesus, we should ALL take action to extend small acts of kindness; like that grandmother, like my Forever Friend. Take the Time, dear reader! Do a little something, for someone, all year ’round! Merry Christmas! In 1969, Doug & I had been dating about 9 months. That April, we found out I was pregnant. We made plans to “runaway” and get married. We found a cute little church in Gallatin, Tn. With a nice little motel almost next door for the “honeymoon“. We planned for me to spend Friday night with my girlfriend, Ann. Doug would pick me up early Saturday morning and off we would go into our future. In a classic case of, this is an example of how the rest of your life is going to be, Saturday didn’t go as planned! Doug was almost 2 hours late picking me up from my friend’s house! When I got in the car, he said we weren’t going to Gallatin. He heard from a guy at work, we could get married, quicker and cheaper in a place called Celina, Tn. We started out. We finally pulled into a place that did not even have gravel on the roads! They were dirt! Everyone in town was sitting outside on the grounds, watching us go into the courthouse to have the Judge marry us. After the deed was done, we left beautiful (?) downtown Celina, to start the honeymoon. We got lost. We drove for over 2 hours; nothing looked familiar! Finally, we saw a road sign that said, Nashville, 95 miles! OMG! We finally made it to Franklin, Ky. late that afternoon. I was exhausted! Franklin, at the time, had 2 motels and a drive in hamburger joint called, Hutch’s Hut, all within 3 blocks of each other. One motel wanted $7.00 for the night; the other wanted $7.25. Since we only had about $8.50 left, we drove up & down the road comparing rooms. Deciding on the seven dollar room (duh), we walked next door to Hutch’s Hut for supper. I was starved! They had outside picnic benches to sit on. We each got a hot dog and a coke. Doug sat down & ate his hot dog. I left mine on the table to go get mustard and napkins. While I was doing that, a huge DOG jumped up on the picnic table and ATE my hot dog, in one gulp!! We had no more money. I spent my honeymoon night Starving! Stupid dog! Stay tuned. I’ve had several requests for this one. Amber, Linda, here you go. My son Brian was 10, 11, around that age. He needed new tennis shoes. Bear in mind, this was before Air Jordan’ s etc. He & I went to the Mall one Saturday, to a shoe store. You browse & try on shoes by yourself. If you Have to have help, someone will eventually come help you. Brian & I picked out the pair of shoes he wanted & when the guy, “Brad”, came by to check on us, I told him the shoe Brian wanted & asked him the price. I told him the size we needed. He took his little shoe thingie and measured Brian’s foot. He told me that my son needed one size smaller than the size I had requested. What followed was a verbal tennis match between myself & Brad concerning how to buy the proper shoes for an 11 year old boy. Thus, Brad – “I can not sell you the size that you want. They will not fit your son. I have been sellng shoes for 2 years & I Know what size you need to buy! If you buy this size anyway, and leave this store, you can Not return them!” At this point, he is getting red in the face. I looked at Brian and His face was red, as well. He pulled on my arm. “Come on, Mom, let’s just go! I don’t want the shoes, anymore.” I looked at my son’s embarrassed face, put the shoes back in their box, and Brian & I left the shoe store. All the way home, I was fuming! Talk to me like I was in kindergarten! Embarrass my son in public! Oh, I was soo mad! Plus, Brian Still didn’t have any shoes! I thought about it all night. Should I call this guy’s boss and report him? Get him fired? Finally, I decided what I would do. Monday morning, I got up and went to the bank. The day before, Brad had told me the cost of that pair of shoes, including tax. I got a bank bag and counted out the exact amount in quarters, nickels, dimes, and pennies. I drove to the mall, locked my purse in my car, and took only the bank bag into the shoe store. I picked up the pair of shoes that Brian wanted in the size that I wanted. I walked up to the check out counter & Brad waited on me. He didn’t remember me, of course. He rang up the shoes on the register, told me what I owed, and I opened the bank bag. His eyes got wide when he saw the change & he asked me did I have a check or credit card. I told him, “My son saved his piggy bank money for these shoes.” As Brad started to count out $62.87 in change, I leaned over the counter towards him, lowered my voice and said, “I was in here yesterday, with my son. You waited on us. I know you don’t remember me, but I did this on purpose. You embarrassed my son and I could have reported your behavior to your boss. Instead, I chose to take this time to speak to you. I don’t know if you plan to sell shoes for the rest of your life or not. But there are a couple of things that you need to know. Brian is not my First child – he is my third! I have been buying tennis shoes for kids since before you were born. You need to nderstand that the customer is Always Right!” At this point, Brad says, “Well, it’s my Job to tell you,….” “Yes, it is your job to tell me that, but once you do, and I still want what I want, you don’t have the right to argue with me. I am the customer – I am Always right”! I don’t know whatever happened to “Brad”, but I hope he learned something that day! Stay tuned. My mother and father had 3 children and Sarah, all her life, worked outside the home. This was at a time when most women didn’t. She was a telephone operator for 15 yrs. We had housekeepers who stayed with us when I was little. Later, my grandmother came to live with us. Anyway, Sarah and my Daddy worked full time. When they were home with us, it was a peaceful time. I was never spanked as a child (yeah, that explains a lot, right?). Not by my parents, anyway. I do remember a couple of times my grandmother taking a switch to my legs. That flipping Hurt! Old coot! Anyway the point of this is that when Sarah went into the nursing home, and started physically hitting people, that was totally out of character! Rosewood called me one day and said, “Ms. Sarah is okay but…we had a screamer on the hallway this morning. Before anyone could catch her, Sarah had rolled her wheelchair up to the screaming woman, doubled her fist and acting like she was knocking on a door, started wrapping the woman on her forehead, shouting – Shut Up, Shut Up, Shut Up! !” They separated the women, (no the lady did Not quit screaming), and Sarah had to go to time out! They explained to me that many times, dementia patients will resort to hitting because they loose the use of their words! Not my Mother! She knows what shut up is! Stay tuned. 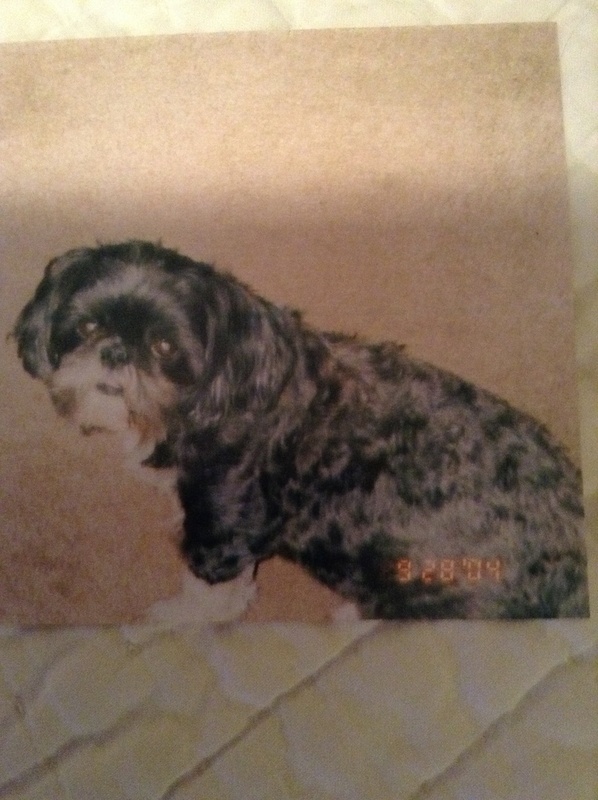 When I bought Trixie 17 years ago, I got her at a local pet store. (I know, I hear ya!) Brian’s golden retriever had been hit by a car the week before and he was devastated! I called the local animal shelter, daily, trying to find a small dog for inside the house. Doug refused to fence our yard in and I wasn’t going to take a chance on another “outside” dog getting hit by a car. Anyway, better than a week passed and theanimal shelter never had a small dog. So I went to the pet store and picked out Trixie. The pet store owner said she was 6 weeks old and weaned. She said the “bump” on Trixie’s belly would go away, because they had given her medicine. I took her home and let Brian name her. Doug was mad because he didn’t want a small dog in the house. Brian let Trixie stay in his room one night and he was done with her! Anyway, when I got her home, she did not eat or drink anything for two days! I thought, my God, I have spent $450 on this dog and she’s going to die on me! I rushed her to the vet. He said, she was only 4 weeks old, not 6 and she was NOT weaned! Furthermore, the “bump” on her belly was a hernia. No “medicine” would make it go away. He said to take home, give her warm milk to drink and soft scramble her an egg twice a day. He would do the hernia repair in a couple of weeks. Doug and Brian both groused about how much trouble she was. How I should have gotten a “real” dog; not some little “rat” that was causing so much trouble. Well, you get the idea. Doug would feed her in the mornings, while I got ready for work. I would come home at night and feed her. Except for occasionally throwing her a ball, Brian had checked out of the whole business. This went on for about a month. One morning, as I walked into the kitchen, Doug was at the stove, scrambling an egg. As I walked in, he said, “I love you, honey.” I said, “Oh, that’s sweet! I love you, too.” His face turned bright red and he said, “Uh, I was talking to the dog!” So began 17 years spent happily with our Best Friend! Early this last Friday morning, her little heart gave out and she became an angel. Rest in Peace our sweet girl! You were truly loved and will be greatly missed! Love, Mama. Stay tuned.